Here are some of my favorite Jack pictures from 2007 (Year #2). Emma Elizabeth Robinson was born 2008-01-05 at 9:58 pm. She weighed 6 pounds 5 ounces and was 19.5 inches long. I've been bad about putting up pictures of Jack. Here are some of my favorites from his first year. 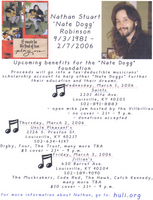 The 2006 Nate Dogg Benefit was great!! I had a blast. Here are some pictures from each night. Check out this amazing sketch by Scott Egan. 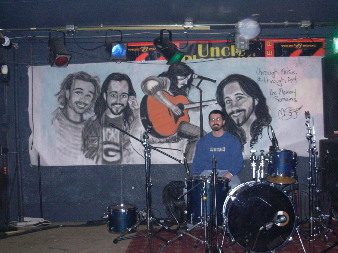 "through Music & through Art...The Memory Remains"
Travis cheesin'. 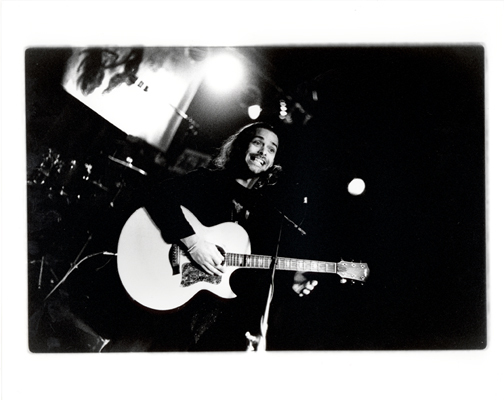 Taken by kremer. Hey kremer, give me a shout. Click here to check the rest. 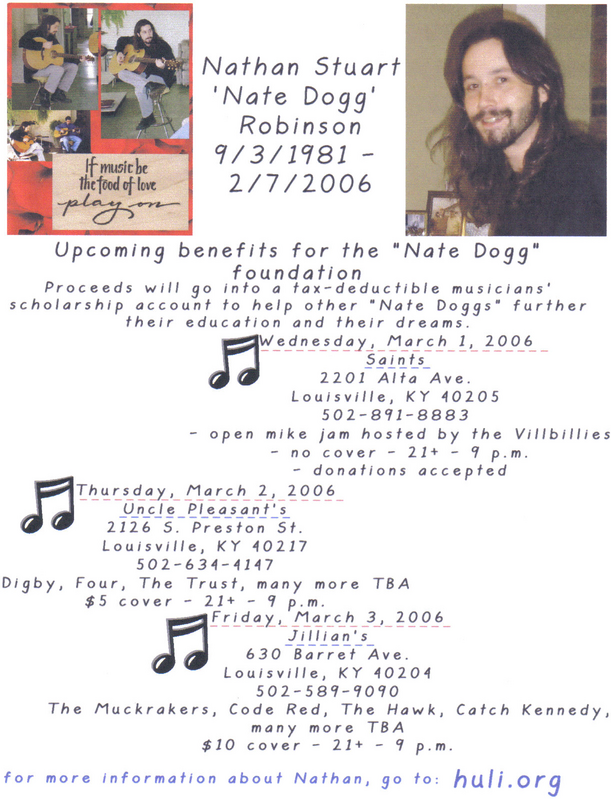 There will be a few benefit shows in Louisville to celebrate Nathan's life. Here are the details. Check out the flier Mom put together. Here is what's left of the car. The driver's side is completely gone. I can't believe he made it out of this. 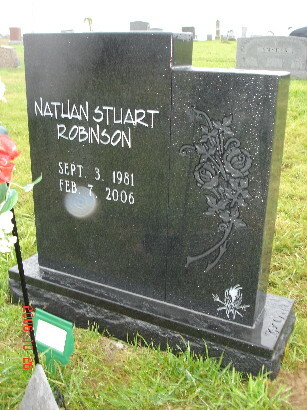 My brother Nathan passed away after being invloved in a car accident on Hurstbourne and Stonybrook in Louisville, KY. 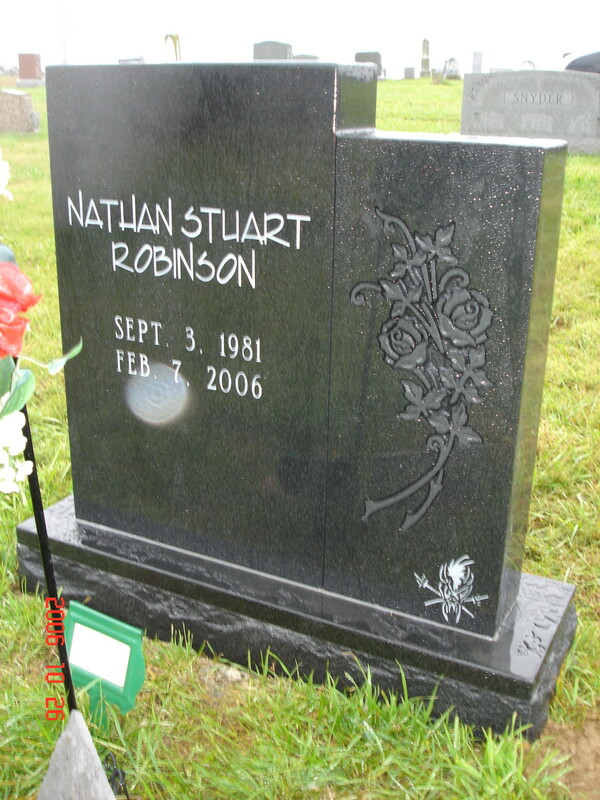 He was 24 years old. Enjoy the next world bro. The funeral will be Friday, February 10th, at the Hardinsburg United Methodist Church at Noon Eastern time. There will be a viewing, Thursday February 9th, at the Trent-Dowell Funeral Home in Hardinsburg, KY from 4:00 pm - 9:00 pm Eastern time. 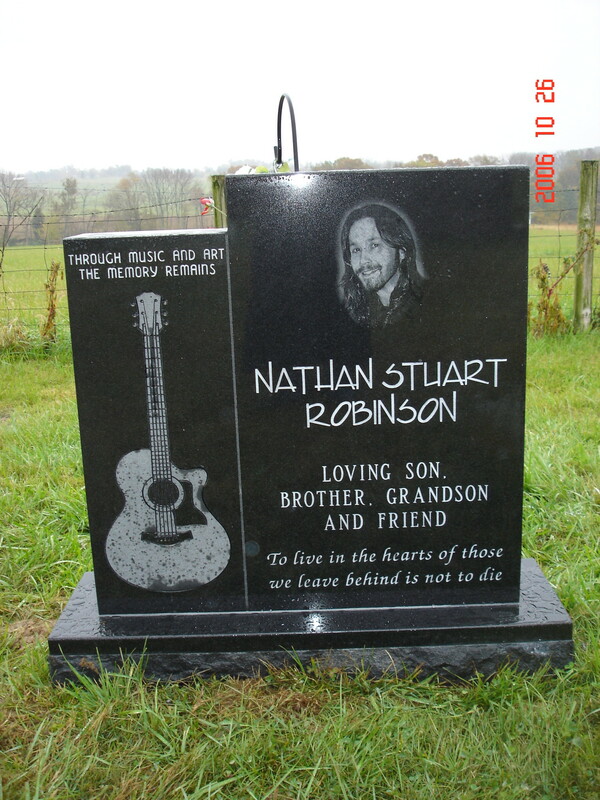 There will be a gathering of musicians after the funeral to pay tribute to Nathan at the church hall. There is an article in the 2006-02-08 LEO about Nathan. There is an article in the Courier-Journal Thursday, February 9th. Well, I'm officially a Dad now. Jack Thomas Robinson was born at 1:00 PM on December 29th, 2005. He was 6 lbs. 1 oz. and 19.5 inches long. Riley turned 1 year old on 10/13/2005. He's not a puppy any more. 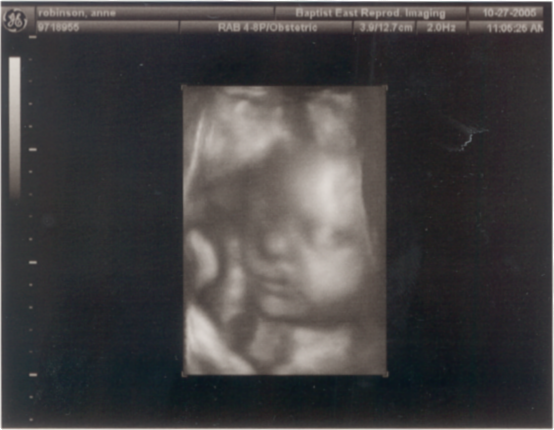 They did a 4-D ultrasound the other day at the hospital. I'm not sure yet why they call it 4-D, but they're really amazing pictures. 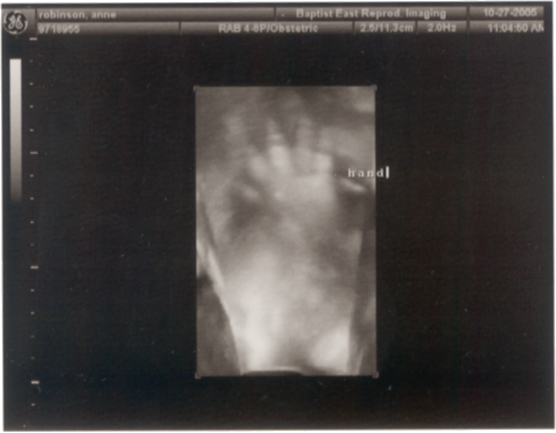 We're pretty confident that it's a boy after 3 ultrasounds which they claim it's a boy. So, he has a name as well Jack Thomas Robinson. Well, I'm going to be a father around January 2nd 2006. We had an ultrasound this morning and it appears to be a boy. Check out the new forums I added. We have some crazy discussions going. Check out some of the costumes from Halloween at Headliner's. Check out Anne's wonderful carving work. Well huli.org is finally back online after a storm took out my DSL modem. Don't you hate when you call the help desk and all they do is read to you from a script. Argggghhhhhhh!! Honeymoon pictures from 2001. Includes the Tulum Mayan Ruins. Check out some photos from this years JavaOne Conference. Check out Nathan's house after the move. More pics of the ice strom 2004-01-25. Cleaning up at Nathan's new house. Check out some pictures of the ice storm we had on 2004-01-25. Here are some pictures Anne took of Frasier and the flowers in the back yard. Thanks Linux Journal for my new favorite bumper sticker!! Look what finally arrived...it's my new bass!! Here are some pictures from Myrtle Beach, SC and Raleigh, NC. Special thanks goes out to my buddy Kekoa for giving us the chance to hang out with Jack Johnson after the show on 06/28/2003. Check out some pictures from the show here. I recently attended the JavaOne Conference in San Francisco and who else would they choose for musical entertainment for a buch of computer geeks than Keller Williams!! I was so stoked, I was like first in line and got to sit front row. I had the chance to see Keller do his magic previously, but didn't get to see what was going on. If you have heard of Keller, you know what I'm talking about. What a great show! Here are some pics from the show. Check out some pictures I took of the dark side of the Moon on 2002-06-14. The phenomena is called "Earth Shine." Play my silly java game.